Education for Rural People: "Education for food & health, Lasalle Beauvais experience". The Education for Rural People (ERP) partnership coordinator made a presentation on "Food and Health, an international policy" within the framework of the celebration of the tenth anniversary of the training on Engineering in Food and Health. project 1: In order to better communicate about cancer and dietary approach, the committee “de l’Oise de la ligue contre le cancer” and Lasalle Beauvais envisioned to create a booklet on the relationship between our diet and cancer that collects sensations and experiences (memories of moments of pain or relief, images or sounds evocative, a word, a sentence, a poem, a drawing to evoke sensations or feelings ..). Students from the engineering school on food & health Lasalle Beauvais, in collaboration with the student nurses of the training institute of nursing, were in charge of contributing with their teachers to the design of boards on "cancer diet ". project2: Lasalle develops cooking classes for cancer patients and training for health professionals (see the article published in October 2012 in the magazine “Top health”). 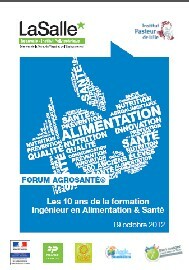 - 2) "agrosante forum: 10 years experience of the engineer teaching programme food & health in Lasalle Beauvais"
- 3) "traditional food and cuisine practice in Picardie (France): the Lasalle Beauvais experience"
- 4) "dietary food practices of the middle ages in France were driven by the culinary expertise of medieval doctors". 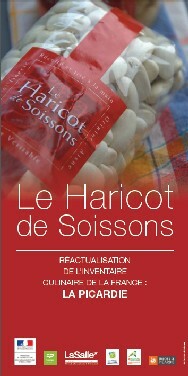 - 5) "experimental learning in culinary science: the Lasalle expertise associated with ducasse education".